I have been psyching myself up for a while to make croissants. As you can see, these are not croissants. 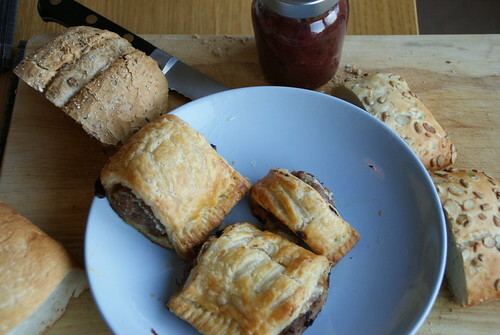 I decided to start my venture into “awkward pastry” (technical term) by using the sausage meat I got in the post-christmas price slash at Tesco to make rough-puff pastry sausage rolls. With the combined help of Michel Roux for the ingredients and BBC Food and some other sites I can’t remember for method, I am rather surprised but delighted to say that I have successfully taken the first step towards my croissant dreams. I have used 3/4 amounts due to lack of enough butter. It was about right for the amount of sausage filling. Use and round ended knife to chop through the flour, cutting the butter up a bit as you go. Don’t make the pieces too small, but just about half the original size. Pour in the cold water and using your hands (yep get sticky!) gently bring the flour and butter together into a lump, turning the bowl as you go. You can just push it together until it’ll just hold in one piece. Flour the work surface and put the dough on it. Shape it into a roughly house-brick shape and size. Rotate a quarter turn and repeat the rolling and folding. Repeat the rolling, folding and chilling two more times if you can. Though comments vary on how many times you need to do it or whether you need to chill it in between. 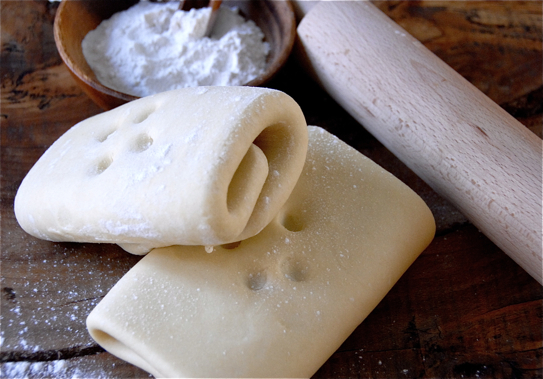 Now you are ready to use your pastry. It should look a bit marbled with the butter. When you do use the pastry only roll in one direction. Look at the strata in that! In a bowl put the sausage meat, bacon, chopped sage, onions and some seasoning. 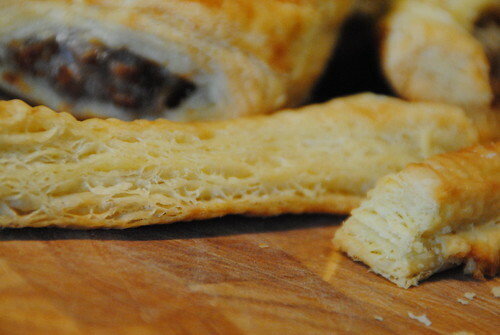 Roll your pastry out into a rectangle about 1/2 cm thick and put a line of sausage meat down it, slightly off-centre. Fold one side of the pastry over the top of the meat to join the other side (I’m sure I don’t need to explain this) and brush a little milk or beaten egg down the place where it will join. 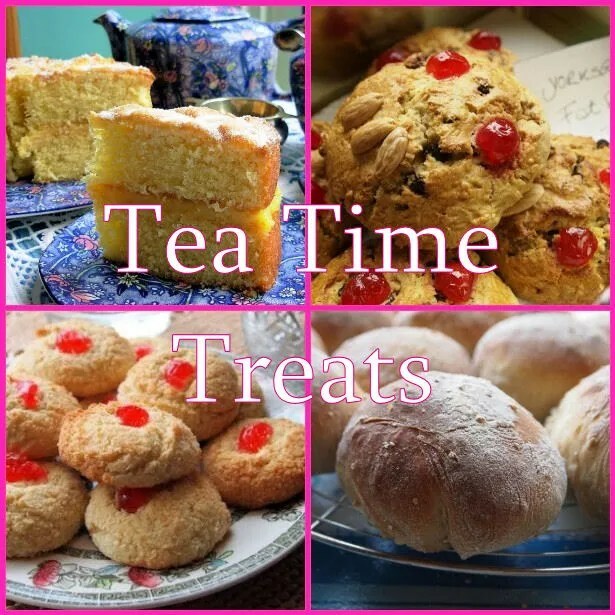 This is my slightly cheeky entry into January’s Tea Time Treats challenge, which is ‘sweet pastries and breads’. I did wrap some of the leftover pastry around chocolate chunks to make fake Pain au Chocolat, but I have been given special dispensation by the incredibly lovely, generous and talented Karen and Kate (is that enough?) 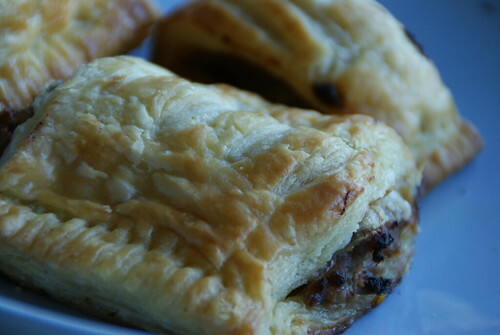 to enter these savoury beauties because I made the pastry myself. How I wish so much I had these for tea tonight rather than the soggy pasta I am currently draining with the hand I’m not typing with! Do you do takeout? Mail order? Thanks ever so much for entering these Gill! They look fantastic !!! Excellent pastry too!